A b o u t - oliversittels Webseite! Raised in a small village in Germany there are not many distractions. The road was early marked outward. School, theological studies and diploma. After working at the university and in a parish, I am currently with the catholic community of Winterthur (Switzerland). There I am also trying to give young people a closer look at the surrounding world and to themselves. I am a photographic self-taught. Masterclasses with Ron Haviv and Christopher Morris (both VII photo) helped me to sharpen my views over the past years. My work includes mostly themes of faith, religion, humans. 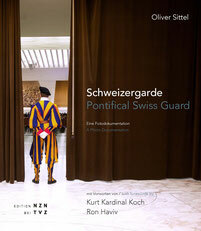 Schweizergarde - Pontifical Swiss Guard, g./e., pub. 2015, 160 p.
Forewords by Kurt Cardinal Koch and Ron Haviv.